Opening ceremony 24th September at 11:00am at Omantel's Head offices Maweleh. Featuring 30 club artist with special guest artists from the Omani Society for Fine Arts. Exhibition will run from 24th to 26th 11:00am - 4:00pm at Omantel Head Office. Exhibition is free. Please come and join us! Next up, the Muscat Pirates youth rugby training season is now under way with training on Sundays (for U6, U8 and U10s) and Mondays for U12s and above. Training for Under 6's is 5-6pm on Sundays and other ages training on both days will be from 5-6.30pm. 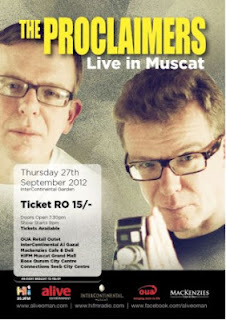 I understand that they have a game here in Muscat on Thursday 11th October. The MRFC Mens 1st XV train every Sunday (from 6:30) and Tuesday (from 8:00) evenings and have their first home game this Friday against Kuwait RFC. Confidence is running high after the pre-season warm-up game against HMS Sutherland was won 38-7. The game kicks off at the MRFC pitch next to the ABA school in Al Khuwair this Friday at 3pm. Post match celebrations will take place in Muscat's premier sports bar, Habana Sports Bar at the Grand Hyatt, Muscat. 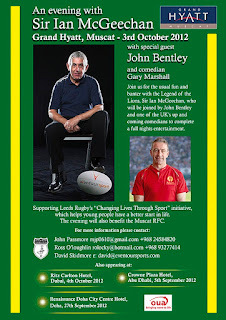 And finally with the rugby side of things, on Wednesday 3rd October at the Grand Hyatt, Muscat, Sir Ian McGeechan and John Bentley are coming for an entertaining dinner, along with a comedian, Gary Marshall. Tickets are RO 45 a pop which includes a 3 course dinner and selected drinks. The event is a fund-raiser for Leed’s Rugby ‘Changing Lives through Sport’ initiative. Their website is here. 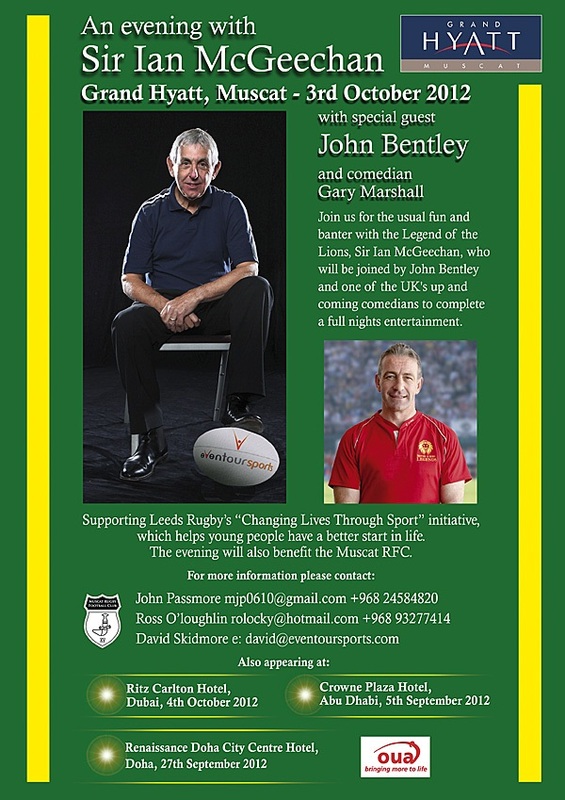 Sir Ian McGeechan is Executive Chairman of Leeds rugby and John Bentley is their Business Development Manager. Sir Ian is best known for his association with the British and Irish Lions Rugby team, playing in 1974 and 1977 against South Africa and New Zealand and as coach in 1989 in Australia, 1993 in New Zealand and 1997 in South Africa. He returned as Coach for the trip to South Africa in 2009. He has held various Coaching positions in UK, including Director of Rugby in Scotland. He played his club rugby for Headingley which merged with Roundhay to form Leeds RFC. John Bentley played Rugby League for Great Britain and Rugby Union for England and was a member of the British and Irish Lions touring party to South Africa in 1997 and played in the 2nd Test. Sir Ian McGeechan and John Bentley are visiting the Middle East and will speak at events in Doha, Muscat, Dubai and Abu Dhabi. The event in Muscat is being arranged in conjunction with Muscat RFC and Muscat RFC will receive some of the proceeds to support rugby in Oman. If you would like to attend this event please drop either John (2458 4820 / mjp0610@gmail.com ) or Ross (9327 7414 / rolocky@hotmail.com ) a line and they will hook you up. Already blogged about this, but thought I'd mention it again: The Red Bull cliff diving world finals are taking place in Wadi Shab (Tiwi) this weekend. 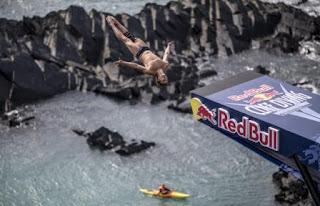 Click here for more information on that, I'd recommend leaving early to get a decent rock to sit on and watch the lunatics divers perform. And of course, this weekend also sees the return of The Proclaimers at the InterCon gardens. I'm currently running a competition to give away 2 tickets to see them for free - click here for more info. And tomorrow (Monday) night see's another instalment of Andy Pyzer's pub quiz at the Copacabana club in the Hyatt.It starts at 8:30pm and runs for about 2.5 hours. More details on that here. Cowi-Larsen JV the consultants for The Development of Muscat and Salalah International Airport Project have been fired by the Ministry of Transport and Communication. Looking forward to your blog on this. Why would I need to blog about this? It was in the paper days ago... December 31st 2012 is their last day, and then Parsons-Brinkhoff take over the project. Not that this change will deliver the airport by 2014. My money is on 2018. 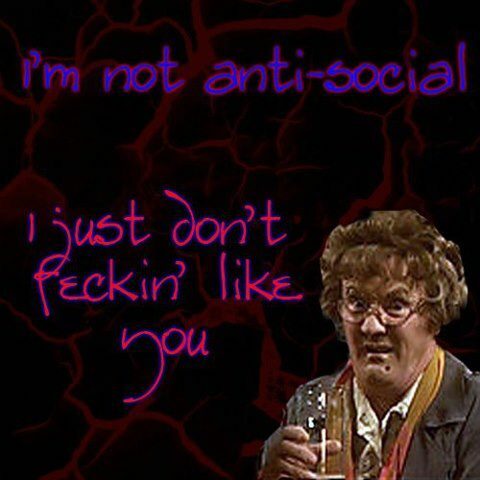 You are incorrect with your statement about the new consultants. A lot happens in a month Anon 2....!